Arbours are great little spots to relax in during those summer months, and the long summer days are served well by this stunning little model. It looks good, and would easily complement any corner space in a garden. And what’s more, it’s good for entertaining too, because it seats up to 3 people. There is lots of versatility here. You can leave it as it is, which is no bad thing because it has plenty in the good looks department. Or you can head down to the garden centre and buy some climbers to really bring a charming look to the unit. 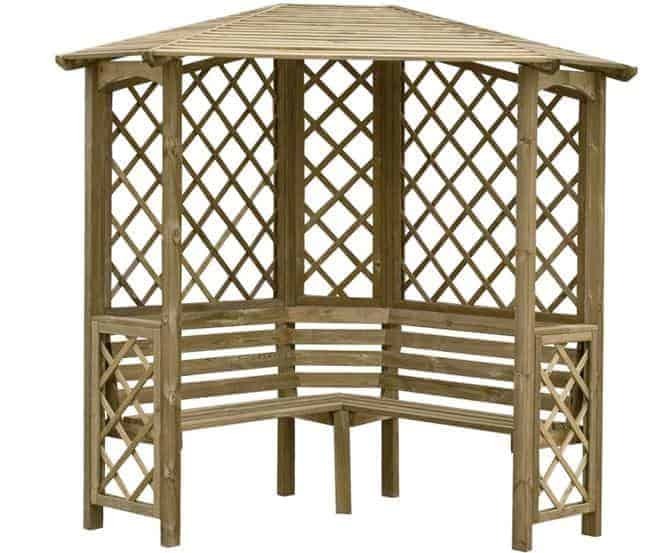 Either way, it’s exactly what you would want for an arbour, charming and rustic. You can’t help but be charmed by this unit. The lattice sides are a big part of this, and they really give an attractive finish to the building. 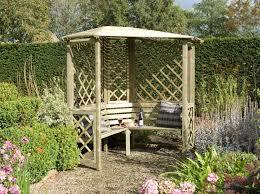 Providing just the right amount of shade, that lattice work is attractive and certainly a big feature. 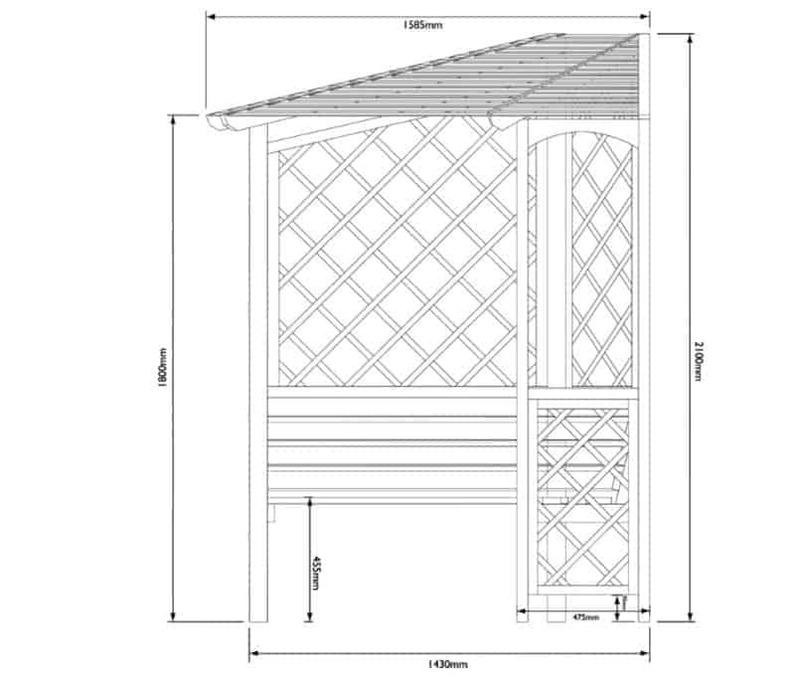 A big surprise here is the open slatted roof. This lets in plenty of ventilation and also sunlight. It is a nice touch, and really adds to the charming feel of the building. Underneath the surface is real quality too. The entire building has been pressure treated. This makes life easier for you, as you don’t have to go through the annual process of treating the building for damp and rot protection. It’s all done at the factory so you have less worry. Softwood, so it has that lovely pleasant and smooth exterior feel. This is an easily obtainable wood, hence the price of the unit. But on top of that it has been responsibly sourced. So it looks great and it has an ethical story behind it. It’s a treatment that is carried out at the factory where the timber is prepared. Chemical preservatives are literally forced into the wood, therefore offering plenty more durability as the strength and solidity that treatment brings is inside the timber, rather than only on the surface. The good news for you is that this removes the need for annual treatment, which is what happens with normal dip preservative treatments. You don’t need to have a professional on hand to help, but we do recommend that you construct it with the help of another person. This is for the sake of safety, because the timber is heavy. Use safety goggles and good tools and you should easily have your new arbour up and looking lovely in a few hours. That pressure treated timber protects it all year round. What’s more, the manufacturer has given you a 10 year guarantee against rot and damp. 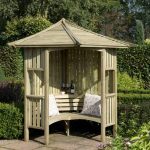 Blooma Chiltern wooden corner arbour: So what’s the quality like? It may have softwood at the core and therefore not initially feel like the strongest building in the world, but it is most definitely built to last. The biggest problems with arbours occur with damp. But this is pressure treated, so all these problems are gone for the life of the guarantee. 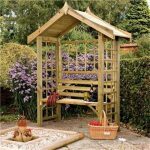 It’s a great arbour and it looks fantastic with that trellis work and those slats. So the looks are great. But the real value comes in the pressure treatment, which brings you an arbour that lasts for a long time. With the construction of our new swimming pool over with, my children love to splash around in it and play by the poolside. They are just learning to swim, and I am not comfortable with letting them play out there all by themselves. But they are also at an age where they want to be more independent and don’t want their mummy keeping watch over them at all times. I tried to get a shade or canopy installed, so that I could sit far away on a garden chair and keep an eye on them without them noticing, but every option was both ugly and expensive. Eventually, I stumbled across the Blooma Chiltern Wooden Corner Arbour. 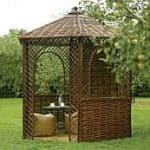 A sweet little design, the arbour was pretty to look at, in my price range, and could be neatly tucked away into a corner, giving plenty of shade. I can now take my book outside, and the children think I’m just very fond of the arbour, which I am, but they don’t suspect that it also doubles as a convenient vantage point so that I can keep a watchful eye on their antics. My grandparents haven’t been getting out much. They always like to stay home. They are quite the homebodies. I have been trying to think of ways they can get out and be in the sun. It would be good for them to experience the outdoors. 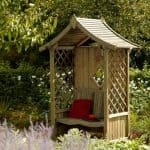 I took the plunge and but this Chiltern corner arbour. At first, I was unsure if my grandparents would actually take the time to use it, but they sit in it every morning and every night. They love watching the sunrise and sunset. It is sturdy and made of long-lasting material. I have been looking to upgrade an old arbour that I had out in my backyard. It was so small and only I could sit in it. I wanted a big enough one where my husband and I both could sit in it. I also wanted to dress it up a bit and add flowers or plants on it. Some people may think this is too small for them, but I think it is the perfect size for my husband and I. I loved that it isn’t painted. I like the natural look of the blooma arbour. corner arbour, I immediately noticed it wasn’t painted, and that it would be up to me to paint it whichever color I wanted. I purchased it and soon as I got it to my house, I painted it the color I have always wanted. My husband helped me and we got it done quickly. This was a great buy. For the price, I was impressed on how sturdy this one. I have never had an arbour that was sturdy so I was hoping this one would be different, and thankfully it was. My garden was looking quite boring. I needed to spruce things up a bit, but I didn’t know how to go about that. My friend told me to look for some arbours online. However, that friend is into expensive things, and I was nervous looking up the arbours because I didn’t know what price range to expect. To my surprise, the price wasn’t bad at all. I decided to order one and I can’t believe the different it has made on my garden. IT looks much better now. I can even sit on the bench which is great. I stay with my grandmother as I am her main care giver. She can do a lot on her own, but I still don’t like her staying home alone a lot. I have a good time with my grandmother. Sometimes I just wish she would spend more time outdoors. 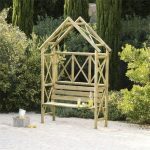 I came across this arbour when I was talking to someone, and they referred me with this link. I purchased it after I read some reviews and looked it over to be sure it was something we will use. I am glad I made the purchase. My grandmother is the one who always wants to be outdoors now. Arbours have always been something to catch my eye. I never imagined myself having one. I came across this one and just couldn’t imagine not purchasing it. It was a great deal. I put it together with no help when I received it. The weather wasn’t effecting it so I wanted to leave a review about the quality of the material. Normally companies will take the cheap route when making these, but not this company. The weather I have isn’t always the greatest and my arbour still stands up.